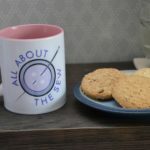 My Husband has been dropping hints to me for some time about sewing him something. 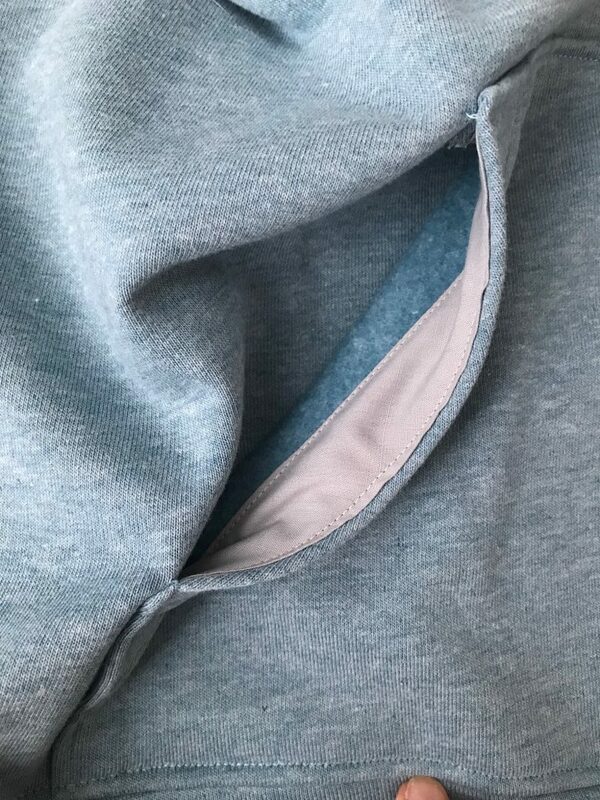 Actually, all he has wanted for a while is for a ripped shirt sleeve to be repaired. Aaaah! That still is in the ‘To-do’ pile and may be for some time!! It just doesn’t appeal to me like brand new projects do!! 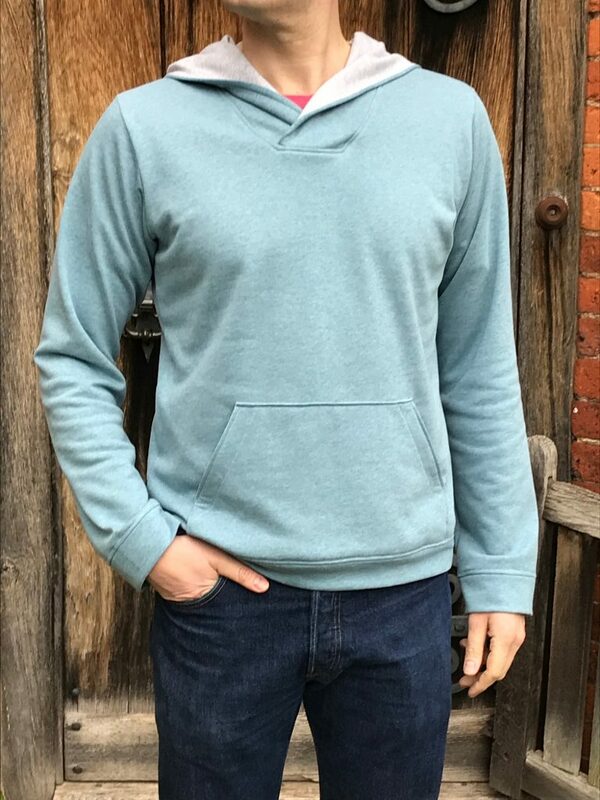 So I thought it was actually about time I did sew something just for him and so put a request out on the Foldline Facebook group page (a fab online community for sewists to share ideas etc) for recommendations for a good men’s sweater pattern. 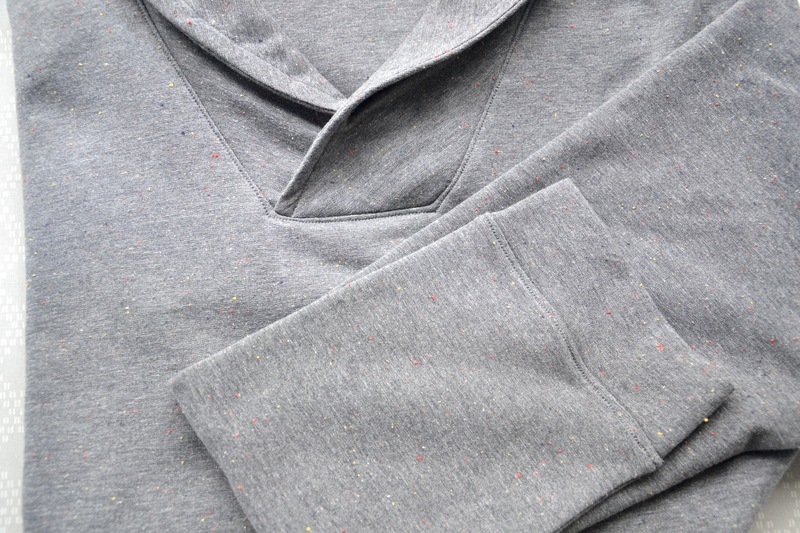 The Foldline recommended the Thread Theory Finlayson sweater pattern. 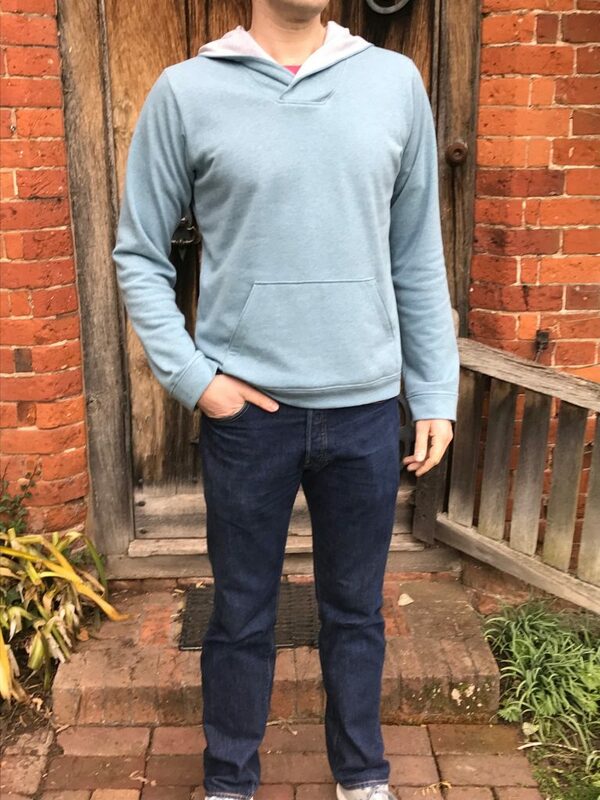 I looked it up and I thought it looked a bit different to a straight forward sweater and the neckline really appealed to me. 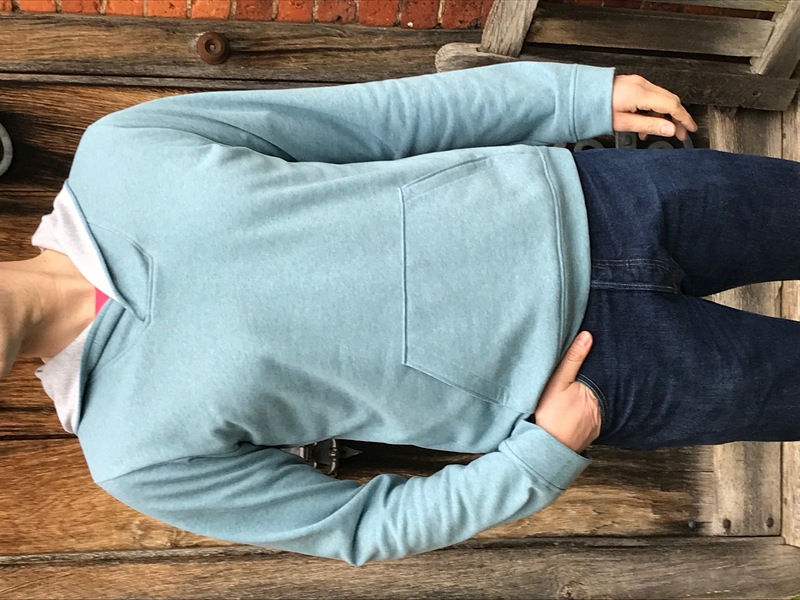 It is described as “a grown up version of the classic hoodie….a wardrobe staple due to its cozy boxy shape and hard wearing cuffed hems…has stylish features that elevate it beyond pure utilitarianism”. Sounded great! So off I trotted to Guthrie & Ghani to get some fabric and buy the pattern. 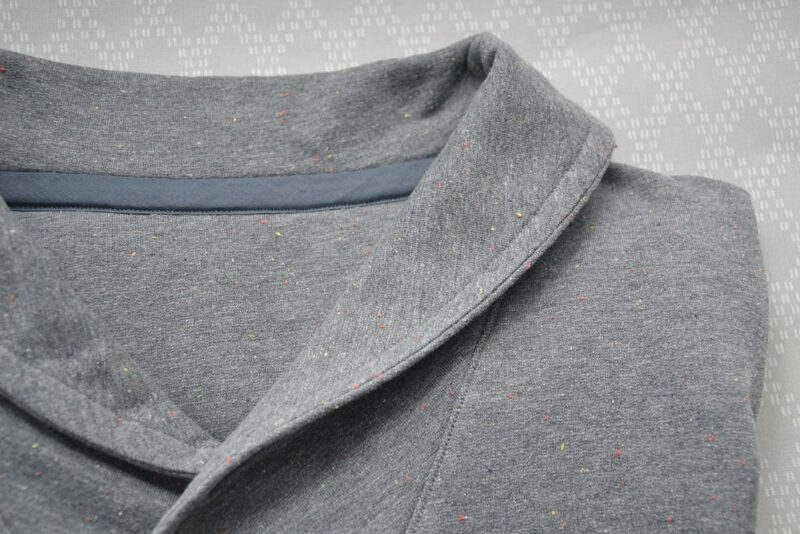 I chose this gorgeous sweatshirt fabric – it’s grey with multi cloured flecks in and has a lovely snuggly fleece reverse to it. It is on the website here but looks like it’s currently out of stock. There were 8 pattern pieces in this version. 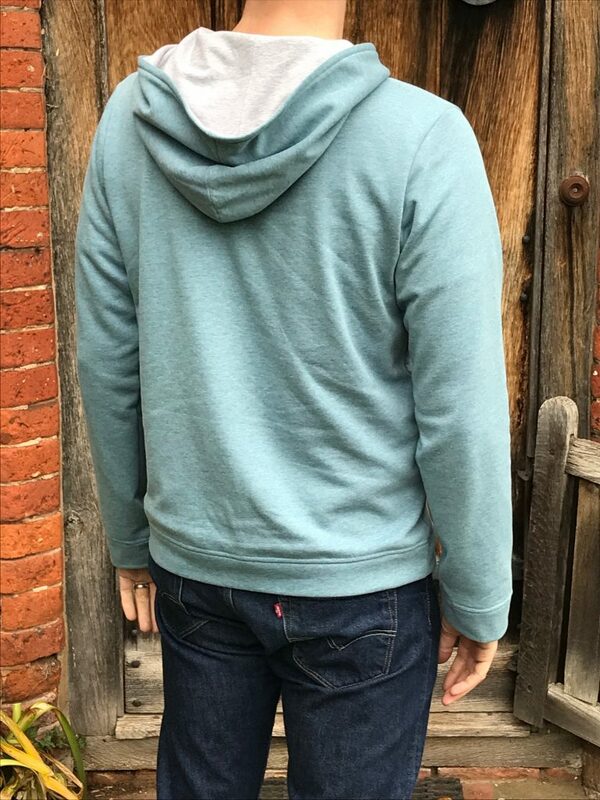 The other version is a hoodie which I would also love to make! I could really get into this menswear sewing!! 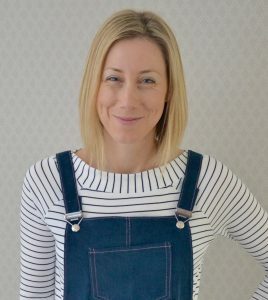 I chose to use my overlocker for most of the sewing – it’s so quick and easy and ideal for sewing with knits. 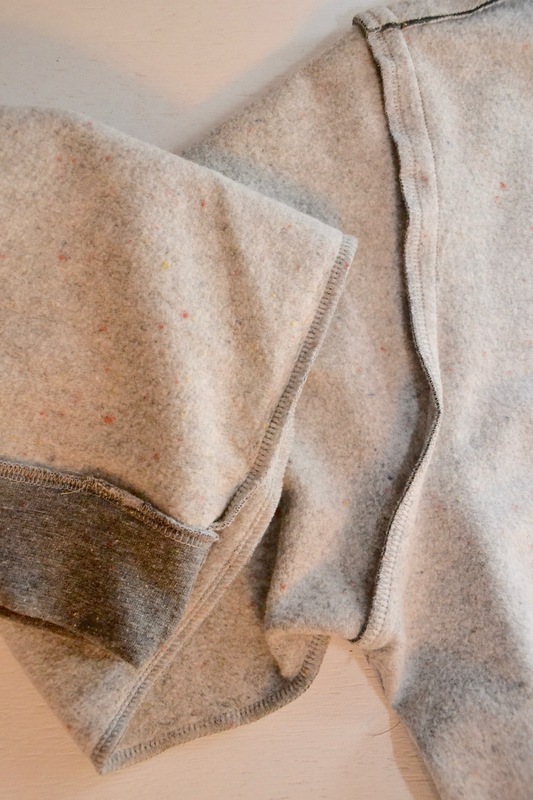 By using an overlocker the seam finishes inside are so neat (most of them!) that it adds to a professional finish. I chose to include the optional decorative facing which gives the jumper ‘hanger appeal’ and makes it look more like a ready to wear sweater. I chose to use the same fabric as the main body as it contrasted well with the light grey fleece inside but you could really play around with this feature and use another piece of similar weight fabric as an inside detail. You can see from the back that this creates a curved line of stitching below the neckline, in between the shoulders which I like. The collar is described as a ‘shawl collar’ and it looks more complicated than it actually is to sew. The instructions are clear and everything lined up nicely which was very pleasing! It helped that the fabric was an absolute dream to sew with as it was fairly stable and just did what I wanted it to do! Yay! I chose to topstitch the seam allowances to the sweater around the entire neckline. This isn’t compulsory but even with pressing it didn’t want to lie completely flat so the instructions said that topstitching would help with this. 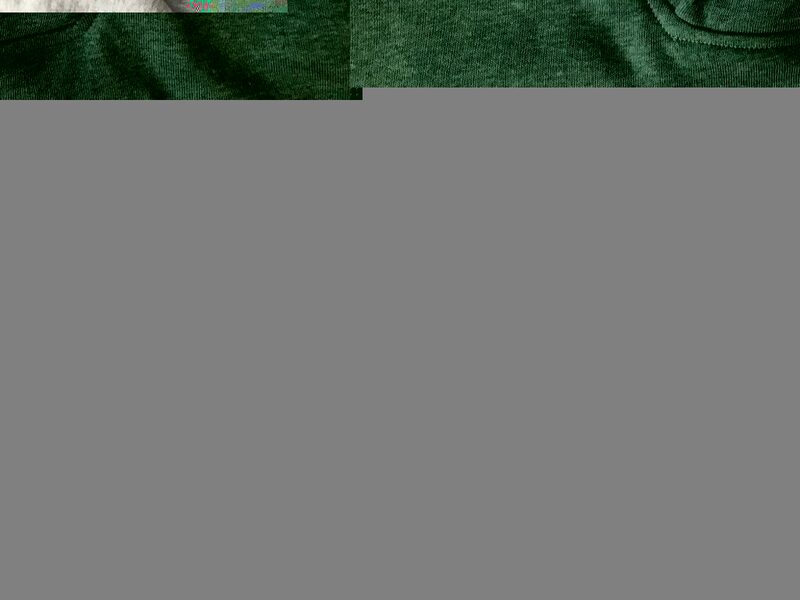 For topstitching on jersey my number 1 preference is always twin needle topstitching. 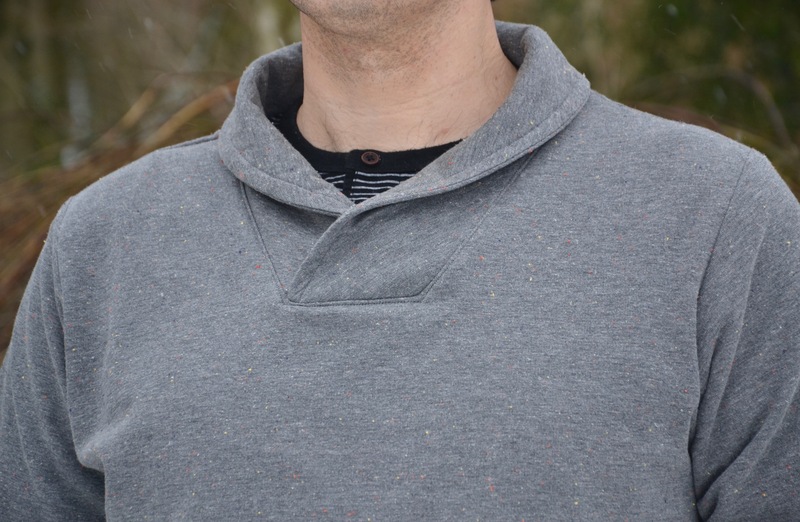 I thought however that a single stitch would complement the topstitching around the collar edge. 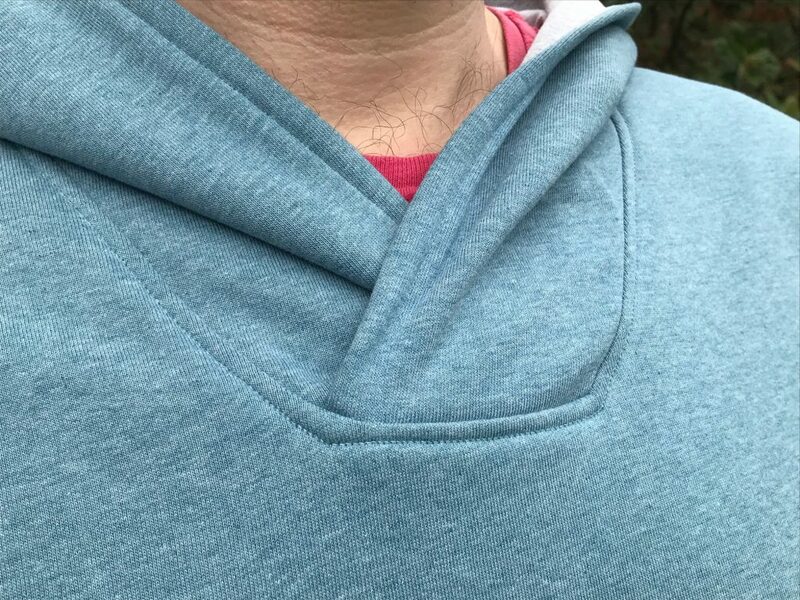 You need the neckline to be able to have some stretch in it so I used a single stretch stitch (like a narrow zigzag) for the topstitching and am really pleased with how it looks. 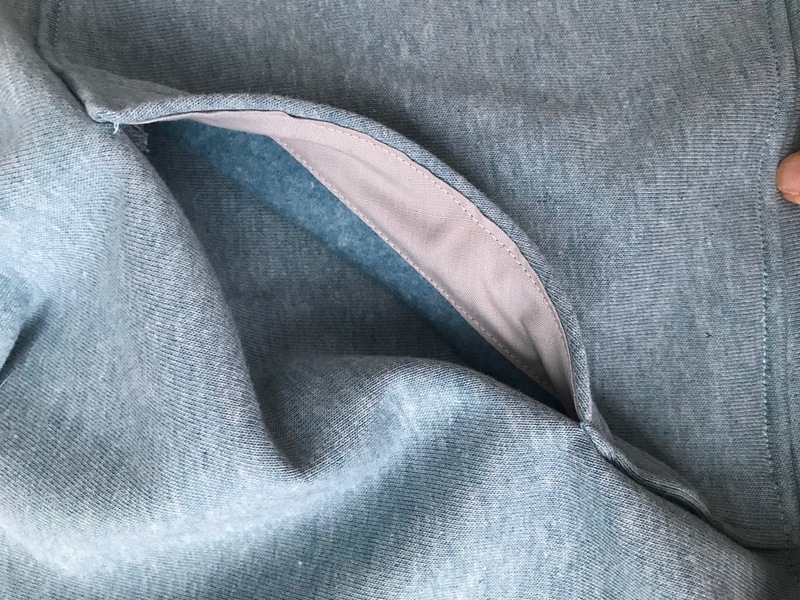 There is also the option to cover the back neckline and seam allowances with twill tape or something similar in order to add to the ready to wear look. 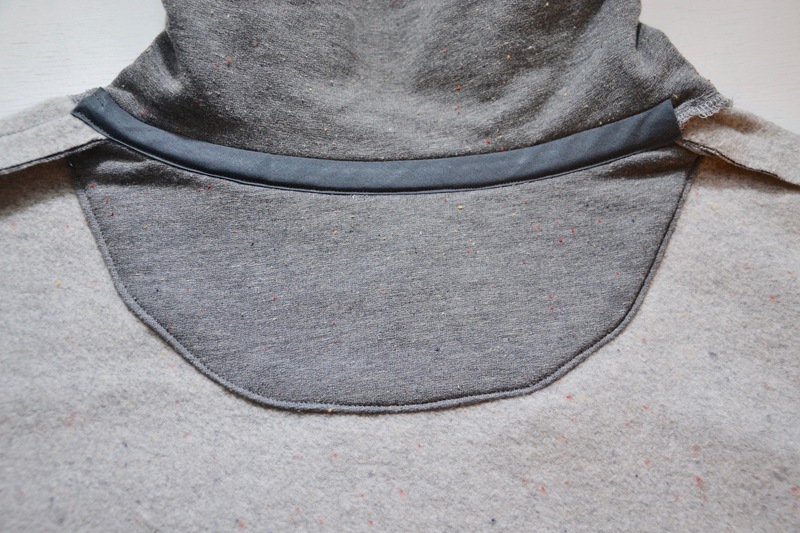 I chose to use grey bias binding for this and I agree – it looks really professional with this added detail. Again you could choose something contrasting as an eye catching feature – I didn’t really understand how it all worked when I bought my supplies so played it safe with grey!! All that was left then was to insert the sleeves and attach the cuffs and hem band. I used the longer optional cuff included in the pattern as my fabric didn’t have enough stretch in it to use the standard cuff piece. I used the same stretch stitch for topstitching around the cuff and hemband. 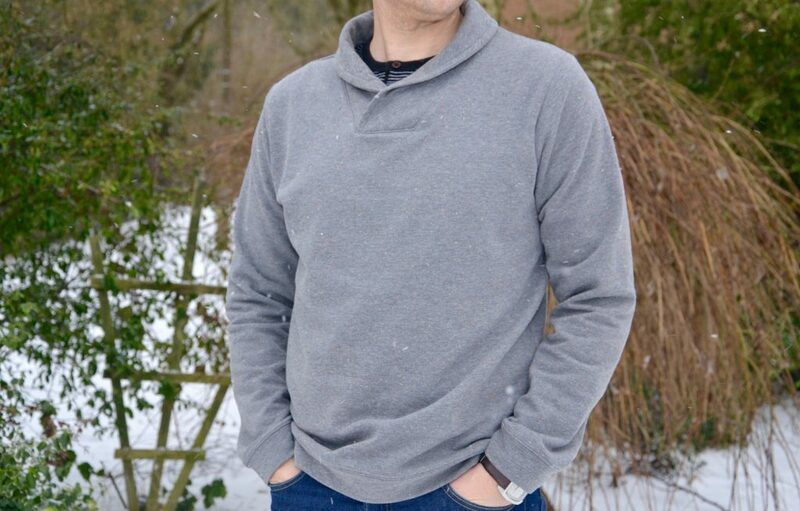 So there we have it – here is the completed sweater with the bonus of a snowy day for an atmospheric backdrop!! 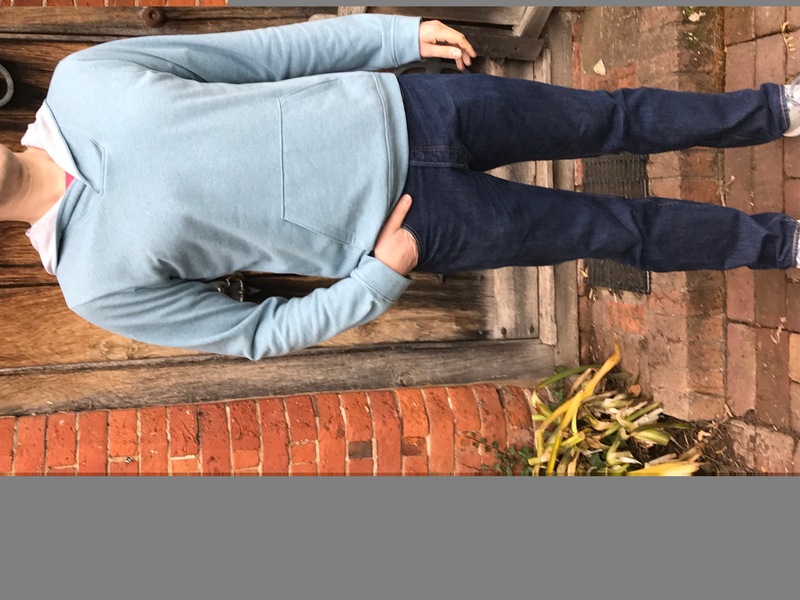 I hope that this may inspire you to have a go at this pattern – I would definitely recommend it and my Husband is really pleased with it too!!! Everyone’s a winner!! 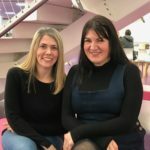 30th March 2018 – Update!! 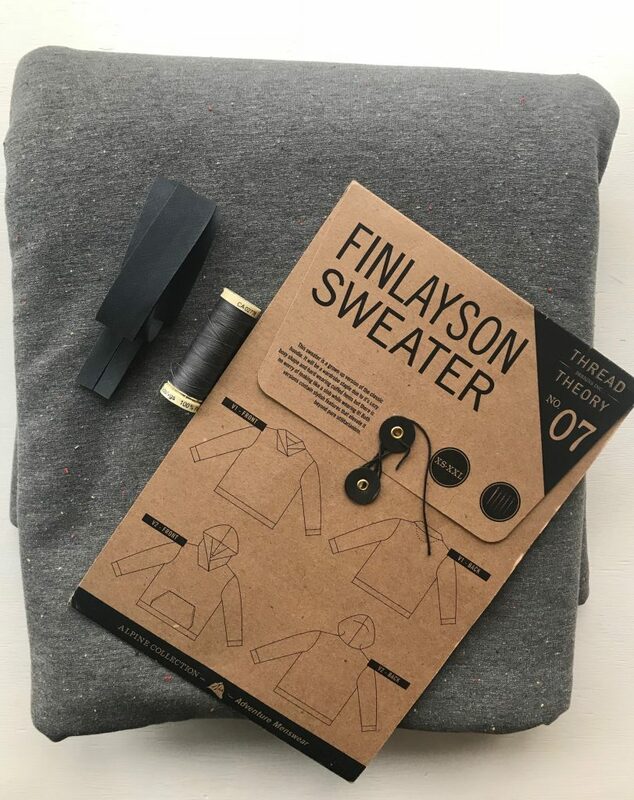 Finished Finlayson sweater Version 2 – the hoody!! 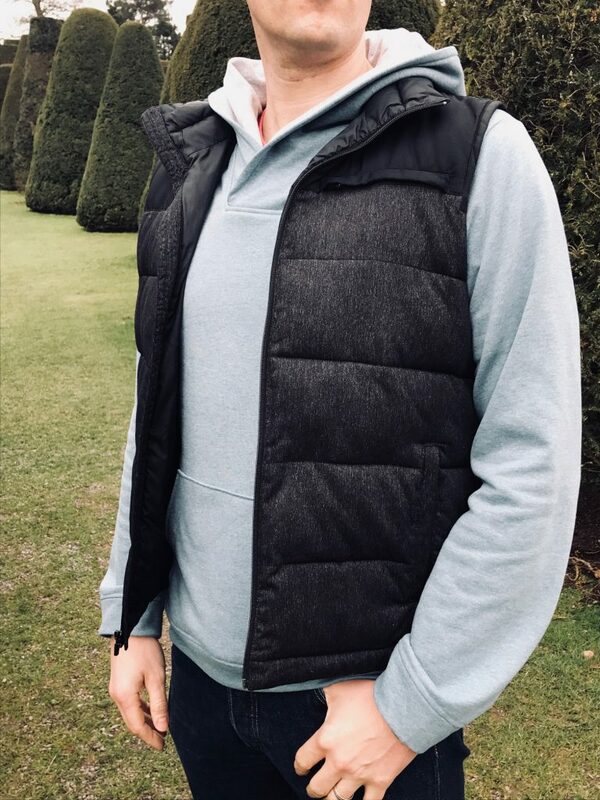 This project was a surprise project but made really easy by having made version A already – I had the pattern pieces cut out, knew the adjustments I needed to make to the length and sleeve length and then all I had to do was cut out the 2 hoody pieces. 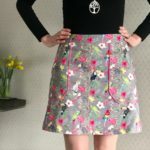 I bought the fabric from Higgs and Higgs at a recent Sewing for pleasure show at the NEC. 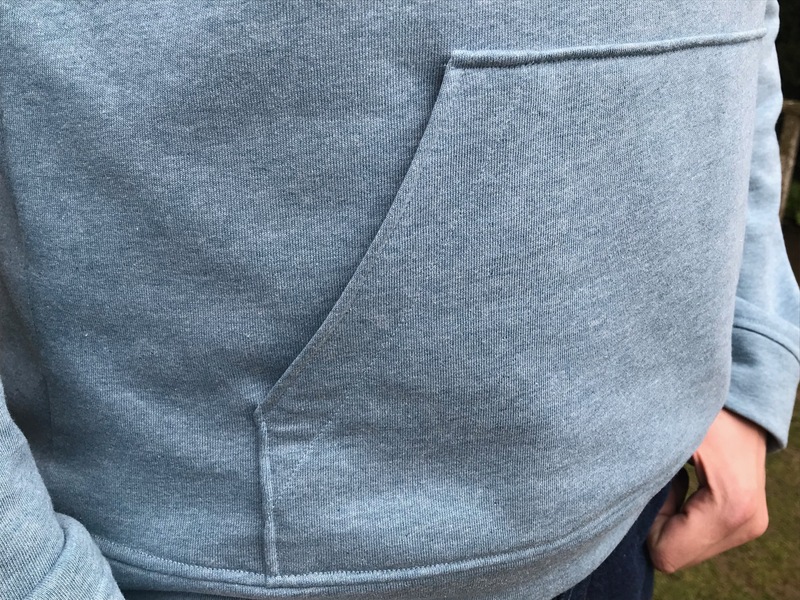 It is sooooo soft and snuggly – I was so chuffed with my purchase and couldn’t wait to sew it up! 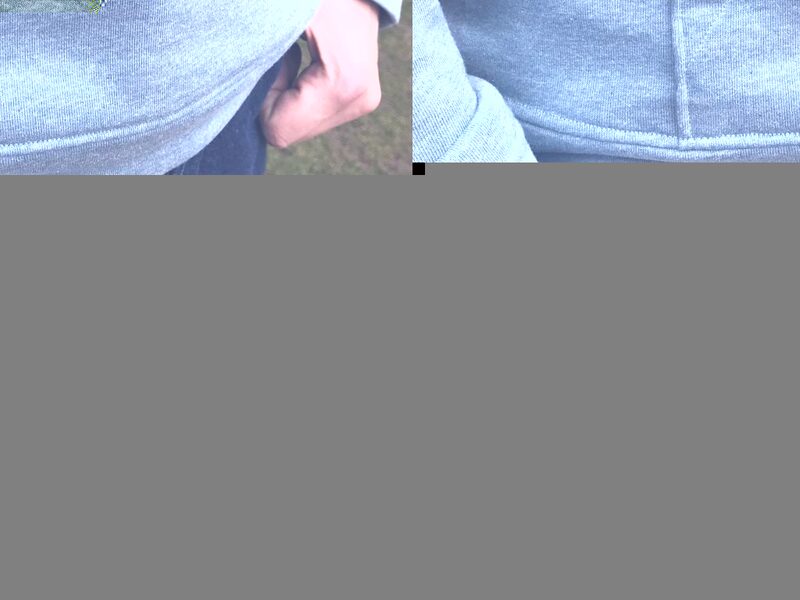 Without further ado, here is the finished hoody! I absolutely love it and am so pleased with it. 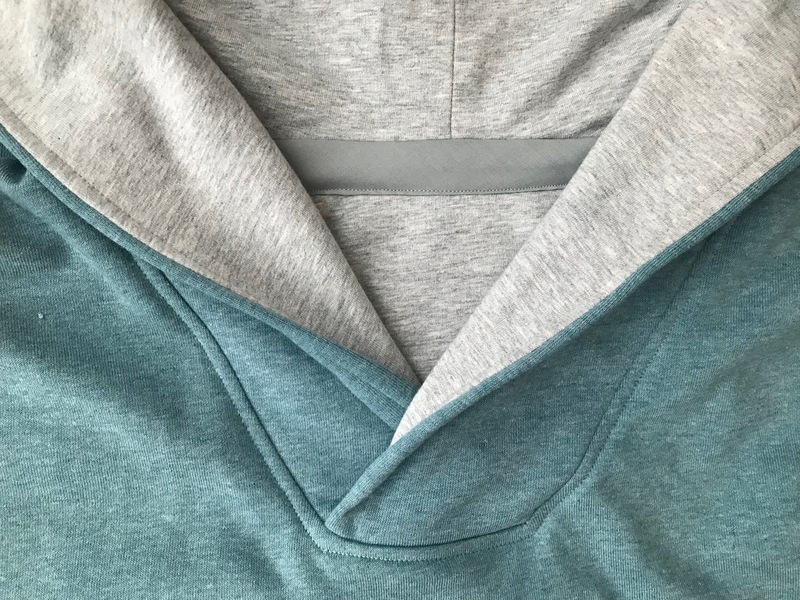 I chose a contrasting grey sweatshirt fabric for the hoody lining which I think looks really effective and a great way to use leftover scraps from another project. 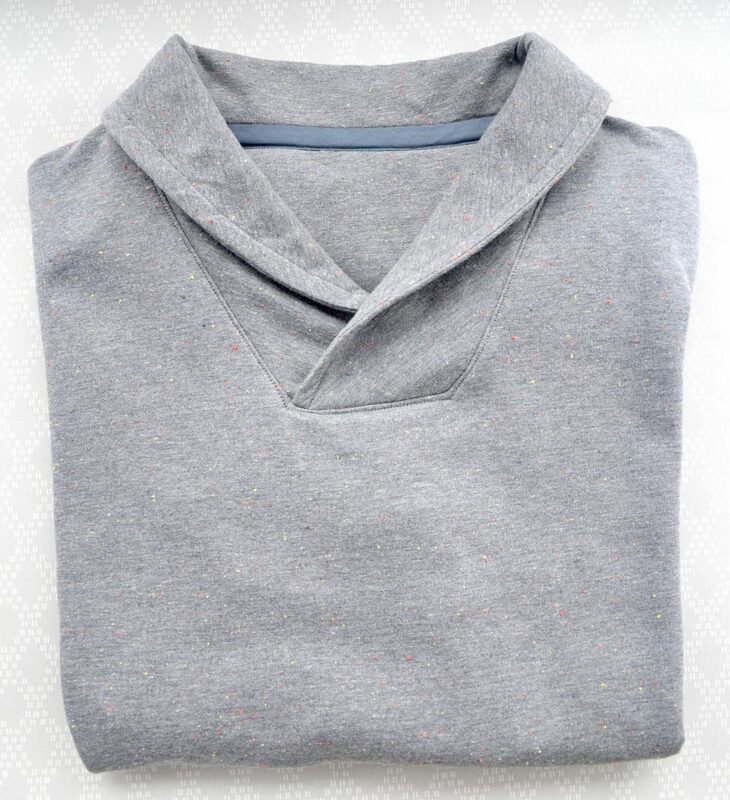 The hoody version has the same crossover detail at the front center neckline – easier to do once you’ve done it once already! 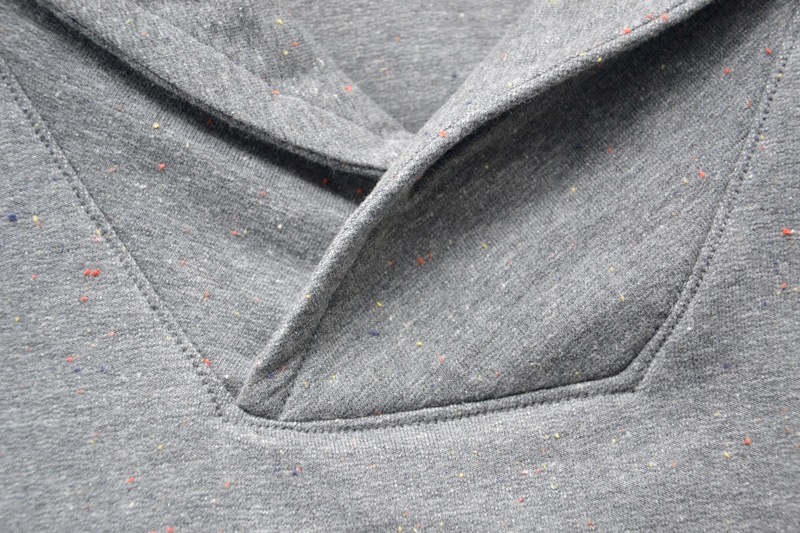 I topstitched around the neckline seam again using the stretch stitch on my machine. 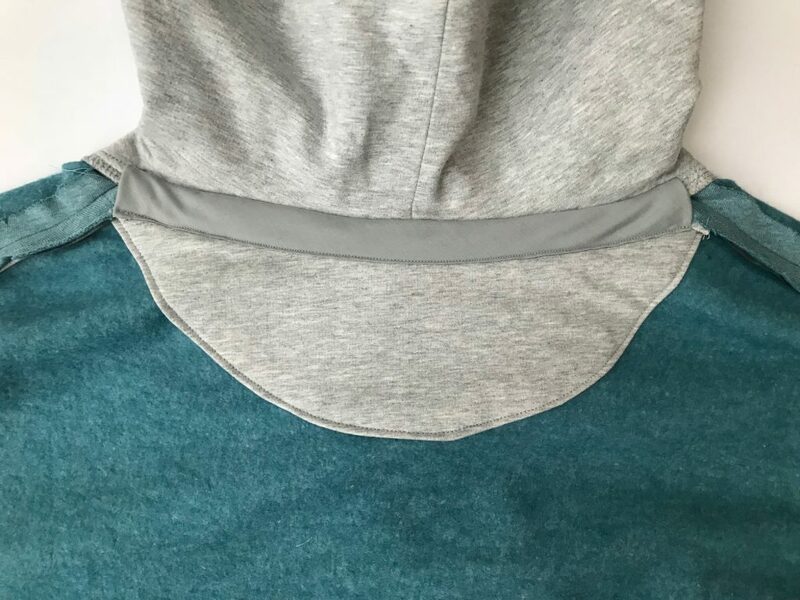 Like version A, it has the same details that add to a professional finish like the optional mock self facing inside and the tape to cover the back neckline and seam – I used bias binding here again but you can use twill tape or ribbon if you prefer. 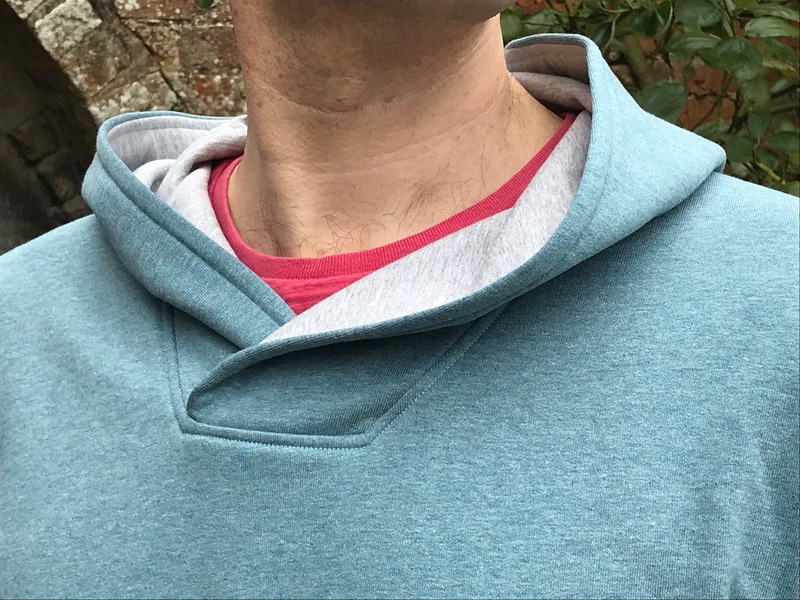 The kangaroo pocket is a great feature for a hoody and adds to the casual look – the edging of the pocket openings is finished with bias binding/tape which I love. So all in all I am so pleased with this pattern and both versions can be real wardrobe staples. I would highly recommend giving it a go and I’ve definitely earned some sewing brownie points by not just one man make but now TWO!!!!!!!! Thx June – ooh maybe so! !